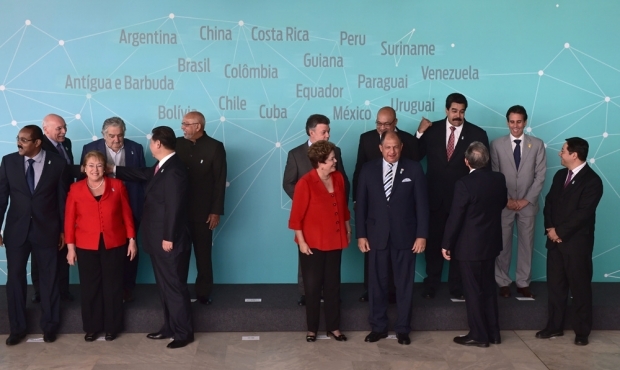 Chinese President Xi Jinping (third from left, first row) moves off of his photo position to greet leaders of the CELAC group of Latin American and Caribbean states, before the official picture of their summit, in Brasilia, last July. Xi had travelled to Brazil for a summit of the BRICS group of emerging powers—Brazil, Russia, India, China and South Africa—and South American presidents. Brazil, Russia, India, China and South Africa (aka the ‘BRICS’) are moving forward with an ambitious plan to shake up the clubby world of development finance. The new BRICS bank announced over the summer 2014 is expected to have a profound impact on the African development finance sector as part of China’s broader effort to re-orient the international system away from the West. Pretoria University research associate Sanusha Naidu is a leading expert on the BRICS and joins us to discuss the implications of China’s agenda on African development finance.